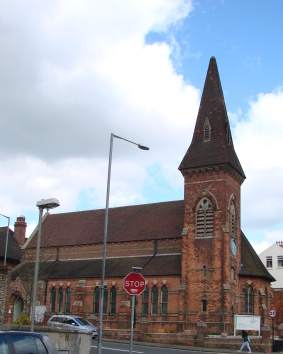 St Luke stands at the point where the early Victorian stuccoed houses give way to later Victorian brick. There was first an iron church which burned down (B 33 p604) and was replaced by the present one, which is built of polychrome brick. This material was old fashioned for 1872, the year when construction began – it was consecrated in 1875. The architect was J Hill (B 30 p855), a local man, and the estimated cost of £2100 shows it was not intended to make a show. Outside, the eye is drawn by a band of stone at clerestory level, but the effect is diminished as there are no openings. The south east tower has an disproportionately large tiled spire on corbels. The west window consists of three stepped trefoiled lancets within a single arch. Inside, the plain crownpost roof is spindly, especially in the shallow apsidal chancel behind an arch, and the arcades have plain round piers with big bell-shaped capitals. 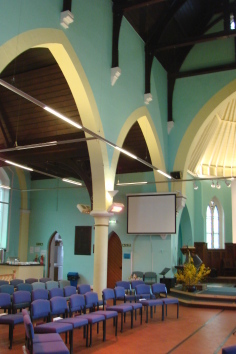 The plan and lack of decoration, together with the west organ-gallery, the lack of stained glass and modest fittings, reveal the evangelical outlook of the parish, the exception in Brighton, which still continues. When opened in 1875, the north aisle was for financial reasons left unbuilt. In 1882 gale damage made it necessary to strengthen the church and the opportunity was taken to add a north aisle to the design of J G Gibbins (B 43 p127) at a cost of over £1500 (CDK 1882 pt 2 p162). Gibbins repeated the trefoiled lancets of the existing church, but his new aisle is broader than the south one that belongs to the original design. Inside, the triple trefoiled lancets are contained within arches, though it is unlikely that these had any intended structural purpose, such as an outer aisle. The interior was finished in brick, probably polychrome like the exterior, but is now colour-washed. This may first have been done during repairs in 1968-69 by Godman and Kay (responsible architect N F Gossage) (ICBS). 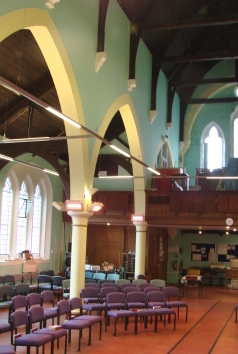 More recently the interior has been re-ordered and the pews have been replaced by chairs. Font: Plain octagonal and probably of the same date as the original church.